This Stanton Trading offset bread knife has a 9 inch serrated wavy edge high-carbon stain-free stainless steel blade. Blister pack for safe handling until it arrives in your kitchen. The 5.5 inch white plastic easy-grip handle helps prevent slipping and bacteria growth. 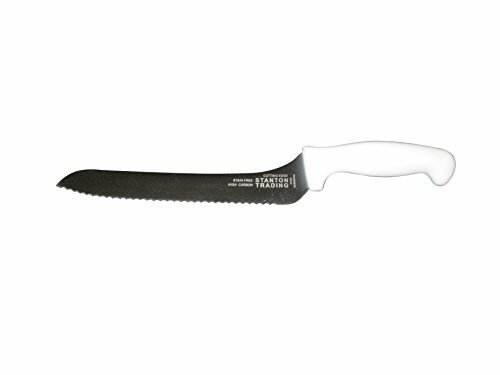 The ergonomically designed raised handle provides knuckle clearance which decreases the stress on hands during slicing. The offset bread knife is the perfect tool for cutting through or slicing through sandwiches, baked goods and crusty bread but will also work well on small roasts, hams and even soft-skinned vegetables and fruits like tomatoes. The Cutting Edge Stanton Professional line of knives offers awesome quality that won't cut a hole in your pocket. Each knife is comes in safe retail packaging with convenient hanging hole for retail display. If you have any questions about this product by Stanton Trading, contact us by completing and submitting the form below. If you are looking for a specif part number, please include it with your message.